It’s been weeks since I was on my Tuesday/Thursday/Saturday running schedule and I hope that once spring weather finally moves in to stay, I’ll be back to consistently running on those days. For now, though, I carefully plan out my runs based on the weather forecast so that I don’t find myself running on my treadmill (affiliate link) instead of slipping and sliding in the great outdoors. Five miles on a treadmill equals an eternity for me, but I’m always grateful I have it when I need it. With a doozy of a snowstorm kicking up and expected to hit early Wednesday morning and continue throughout the day, I decided to move my hill repeats to Monday. I reasoned that I’d have a rest day on Tuesday should I decide to run outside during the early part of Wednesday’s snow instead of the deep post-storm snow on Thursday morning. I ran five miles of long hill repeats after about a mile warmup. 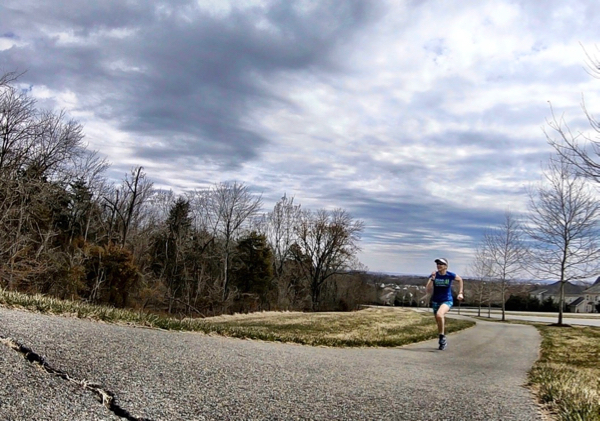 I feel like I’m starting to find my stride on the hills, and that’s a good thing considering my somewhat technical and quite hilly 25K trail race is less than two weeks away. As expected, we woke up to snow on Wednesday morning; although, it didn’t start until after 5 AM. Having canceled my morning clients, I slept in until 7:30 and was treated to watching these two foxes playing in our back yard until they decided to go hang out on our neighbor’s deck. By 11 AM a plow had made it’s first passing on our street (impressive for Virginia) so I headed out for my run. I stayed on the newly cleared path as snow swirled around my face and covered the street once again. My trail shoes did the trick and I didn’t need to wear my Yaktrax (affiliate link). The snow tapered off about half way through my run, leaving me with pretty fantastic running conditions (the snow started later and ended earlier than forecasted so we got much less than expected). I left my plowed street and headed to the trail behind my house for the latter part of my run, just so I could admire the beautiful snow covered trees. I wore my 2010 Boston Marathon jacket, something I rarely wear, but chose because it shows up so beautifully against the white snow. It’s made of a tight twill fabric with a mesh lining and, sadly, it’s almost always too hot for me to wear. Even though I wore it over just my sports bra without a shirt, I still got too hot. After my run, I walked over to my neighbor’s yard to take a picture of their flowering cherry tree. 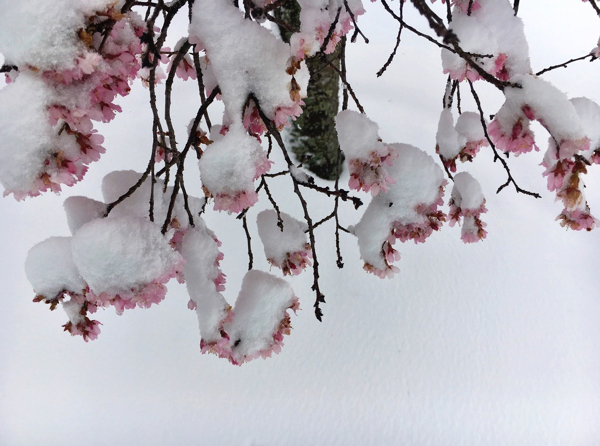 I heard this week that the peak blooming dates have been moved back yet again to April 8-12 for the National Cherry Trees due to the recent colder temperatures. 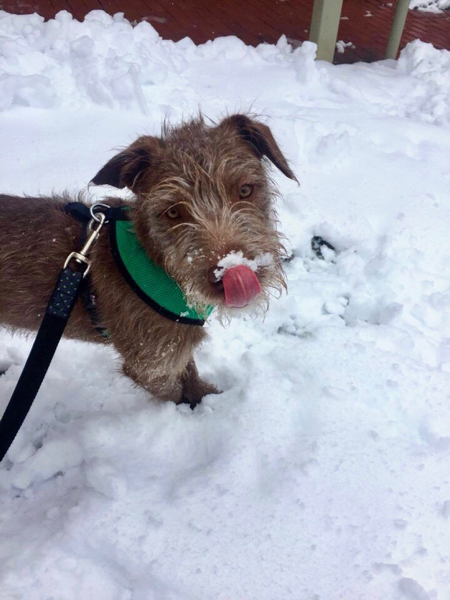 Wednesday afternoon Daniel sent us pictures and video of Pablo enjoying his first real snow. He was hilarious jumping around and attacking those evil little snowballs. By Saturday morning, all of the six-plus inches of snow on the trail had melted and Tracy and I had a great reunion run. We hadn’t seen each other in forever and couldn’t wait to catch up! Even though it was only 30° when we started our run at 7:30 AM, I knew the March sun would warm things up quickly so I opted for shorts. Within a few miles, we both shed our jackets and it seemed like a no-brainer for me to roll my jacket inside itself and attach it to my SPIbelt (affiliate link). Unfortunately, it bounced like crazy and even after I slid it around to the side it still drove me nuts. We laughed hysterically at my tail and Tracy took a picture before offering to carry it (my hands were full with my water bottle and GoPro). After our turnaround, we found the tortoise and hare again. Unfortunately, the hare had been knocked or blown off his rock pedestal and he’s lost his front paws, an injury that will surely slow him down in his next race. While I was out running, Bill was over on the C&O Canal riding his bike. On his way home, he stopped at Chick-fil-A and surprised me with a chocolate milkshake giving him husband of the year status! With milkshake in hand, I happened to look out our kitchen window right as Frasier, our blue heron, landed in our back yard. 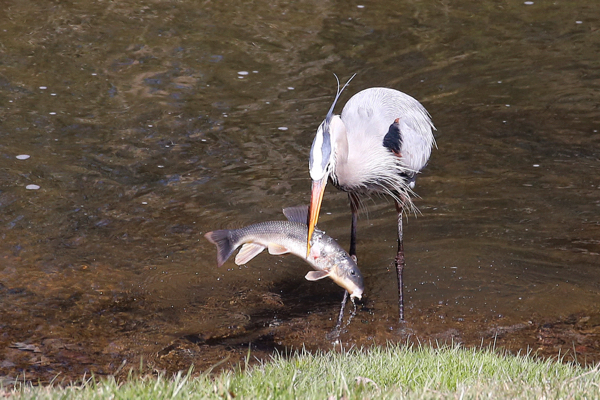 He looked over into the creek, jumped into the water, stabbed a fish, and proceeded to enjoy a delicious brunch. Bill grabbed his long lens and captured these amazing pictures. As I type this on Sunday morning, Frasier has caught another fish and two turkey vultures are watching and begging for leftovers. Yes, our back yard provides endless wildlife entertainment! Looking ahead to this coming week, tomorrow I’ll post my March Race Linkup. Please feel free to join me and let your friends know which races they can find you running in the next few months..
How’s your runners’ math? Tell me a funny story where you totally screwed it up! When it comes to milkshakes, do you enjoy them, and if so, what’s your favorite flavor? ~ I absolutely love an occasional milkshake and love chocolate! I had to laugh when I read the phrase “runner’s math”. My husband, who is also my running partner, always accuses me of runner’s math. He knows that when I talk about going out for 15, we are going to do AT LEAST 15. 🙂 We did race this weekend. A 10k trail race that we had signed up for became a 10k road race due to the snow in eastern PA. I was initially disappointed, but loved the road race once I started. Enjoyed your post a lot. Too bad your trail race got switched to a road race, but I’m glad you had a great time! What is up with this winter???? granted we missed out on all the snow this past week (even with cold temps), but we got dumped on all day yesterday. UGH. My runner’s math is pretty spot-on…however, since my first-ever distance race was a 20K, I still always get really excited at the start of mile 12 to “almost be done.” Of course, I then have the revelation that I am a couple miles from the finish line (and let me remind you I have run almost 40 half marathons, and this issue still happens at almost every 13.1). That photo os Pablo is just too cute! We have a blue heron at the Florida house–my nephew named him Larry years ago. He’s still there. He’s like a dog, only he begs for fish from the boys when they fish in the canal. It’s hilarious! That’s so cool! Frasier is a bit skittish if we get too close. We don’t generally have nearly as many “exotic” animals as you — we did once have wild turkeys, and that’s about as exotic as it gets here. Squirrels, chipmunks, birds, and groundhogs, of course. 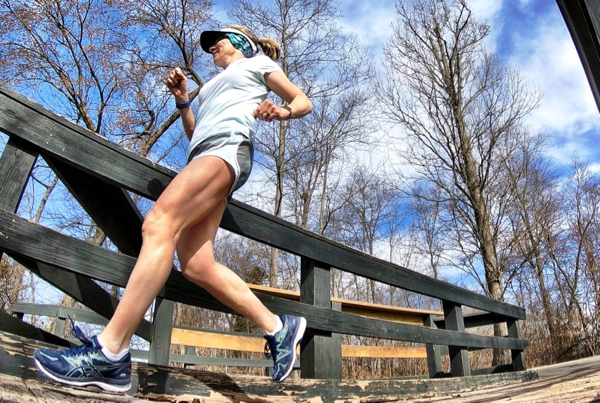 I know I won’t envy you in the summer, but here many of the paths are still choked with snow/ice — but it’s supposed to warm up so hopefully that will finally change and there will be more places to run! I crave variety. Oh dear, I’m just seeing this because your comment (along with Holly’s) ended up in my trash folder. I wonder why WP does this sometimes, but not always? I see wild turkeys out on the trail, but I’ve never seen them in my back yard. 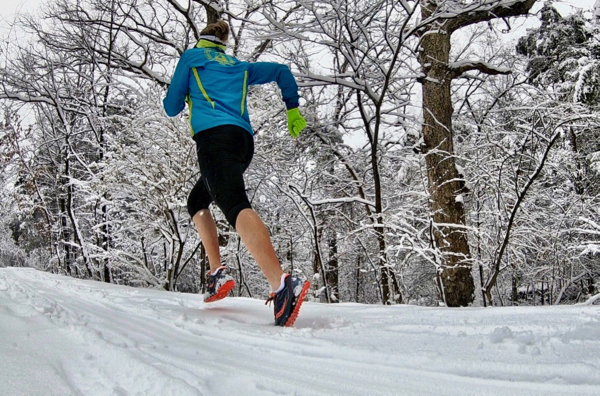 Here’s hoping the snow and ice on your running trails melts quickly! No worries — I don’t think I’ve ever found a comment in the trash (then again, I never look at it!) but regular posters end up in spam occasionally. Snow is almost gone from the backyard. 🙂 If we lived on the sunny side of the street it would have been gone days ago. We have had a momma & baby turkeys in our backyard a few years back. And sometimes just a solo turkey roaming the neighborhood. And we’re not way out in the country, either! Wow, you guys got a lot of snow! We didn’t get any snow with this last storm so I am hoping winter is behind us! My parents had a blue heron in their backyard for a while but it wasn’t a nice one. In fact it ate most of the fish out of my dad’s coy pond! He was so upset! Truly, weather wise this has been the worst March I can remember. Crazy weather- BEAUTIFUL pics of the wildlife! Especially the foxes- (foxi?) Gorgeous! The Boston jackets really are warm- they just don’t breathe or something. It’s not my favorite jacket from a race; some people wear theirs EVERY long run, but as proud as I am to have run Boston, its just not my favorite running jacket! It’s so funny that you wrote “foxes (foxi? ).” When I wrote the post, I kept questioning myself wondering if foxes was correct until I finally Googled it – it is correct. So I’m not the only one who finds the Boston jacket too hot. I wish it wasn’t – I’d love to wear it more! I’d love watching the animal antics in your back yard! You are right, that Boston jacket looks beautiful against the snow. Why is it so hard to do math while we run? The struggle is real. Thanks for linking. Oh no, I’m just now seeing this because your comment (along with Judy’s) ended up in my trash folder. I wonder why WordPress does this sometimes and not other times? The animals in our back yard certainly do keep us endlessly entertained! What a gorgeous photo of the heron. Wildlife is the best. So glad to read about the delayed peak, I was worried I’d miss them entirely as the web is full of stories of people whose only blossoms during the run were on the ground. I did the great saunter here a few years ago (33 mile walk around Manhattan’s perimeter) and we had blossoms the first week in May. Weird how different it is only some 200 miles north. It’s either runners’ math or strava math on every single run. Yesterday was both. 9.33. I was mostly doing the 15K course but I changed the end of the second loop to avoid a hill and between trying to read my watch and not hurdle kids, yeah that was a weird number. Thank you! I will pass your compliments along to my husband, who took the picture of the blue heron. I hope you have gorgeous weather and peak blooms for the Cherry Blossom Ten-Miler. I ran it five times and had a couple of good years – one year in particular was spectacular! Did you see the weather for this weekend? As likely to have snow as cherry blossoms. Nuts! I saw that and I’m so bummed for everyone hoping to see the cherry blossoms. 🙁 I am stalking the weather as well for my race on Saturday. It’s supposed to be 42-45° with a 100% chance of rain at my trail race. It’s gonna be muddy, ugh! Good luck and stay safe in the mud. Entertaining wildlife indeed!! From foxes playing to herons hunting, what a beautiful backyard experience. And all that snow! We don’t get snow here (Botswana) and when I was driving my son to school today it was so foggy. He’s only 3 so asked me if the fog was snow! I’ll have to show him the photos from your blog today so he gets a better sense of what snow is! I don’t like my treadmill much but I too am grateful I have it for those days when I can’t get out for a run. How adorable that your son confused dense fog with snow. I hope he had a better sense of what snow is like after he saw my pictures. My runner’s math is horrible! LOL. 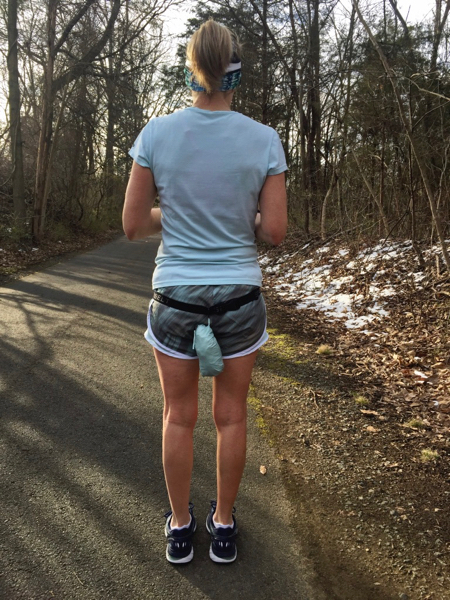 Love your backyard adventures…I’m hoping I can stop having to wear pants during my early morning runs soon…I’m ready for shorts + long sleeves weather!! 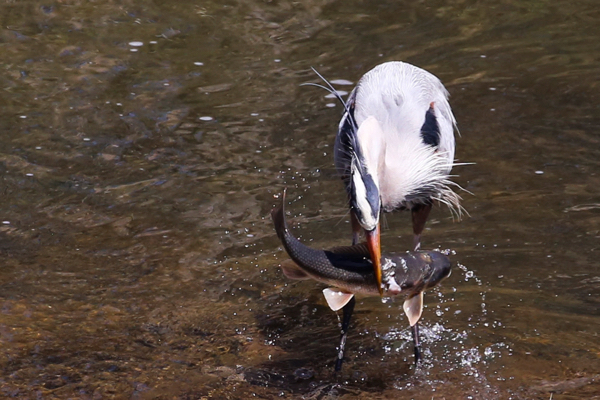 Wow, incredible photos of the Heron! 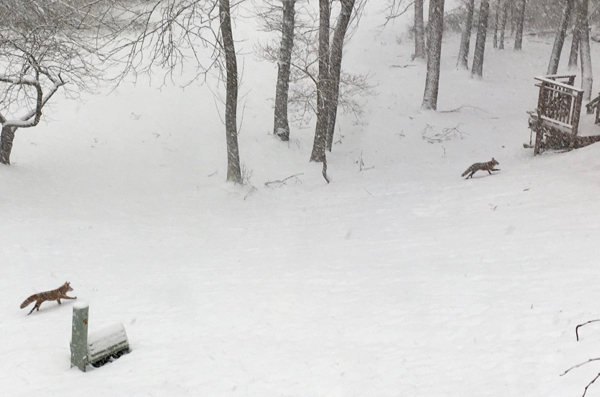 And red fox in your back yard?? You guys do have a marvelous wildlife exhibition just outside you windows! Good luck with the trail race …I’m considering tackling one myself. Thanks, Teresa! I also saw a coyote once. My next door neighbor saw it the following day, but we haven’t seen it since. I’m really looking forward to my trail race. – it’s been too long since my last one. You really should give it a try. They’re so different than road races. Wow – you guys got a ton of snow! Have so much fun at your trail race! I definitely agree that your backyard is very entertaining! The snow looks beautiful, nice while it lasted! I didn’t get to run through the snow that we had last week, I was a bit worried it would be too slippery out and I still don’t have any Yaktraks. When it comes to milkshakes, I like Oreo or just regular vanilla! It was the perfect snow – it was beautiful while coming down, it stuck to the trees, and then it mostly melted the following day! I’ve never had an Oreo milkshake, but that sounds yummy!